The cheekbone also known as malar bone is scientifically known as the zygomatic bone. • The presence of sinus in the upper jaw also reduces the available height of bone in the back tooth regions. Hence we almost, always have a weak bone in the upper jaw. So when there isn’t enough height of jaw bone to support an implant, the cheekbone is used to take support by providing longer size implants. The advantage of this will be that implants may not get easily affected like a conventional implant from infection since the size of the implant is longer and the malar bone being thick is resistant to disease. This method is mainly used for severely resorbed upper jaws and is designed to allow immediate replacement with ﬁxed prosthetic teeth. How is a zygoma implant placed? The zygoma implants are placed in the back section of the jaw approached within the mouth, along with the placement of one or more additional implants in the front region of your jaw. If the case is found too complicated or severe, two zygomatic implants may be placed on each side, which is known as Quad Zygoma. .Teeth are delivered in a maximum of three days. 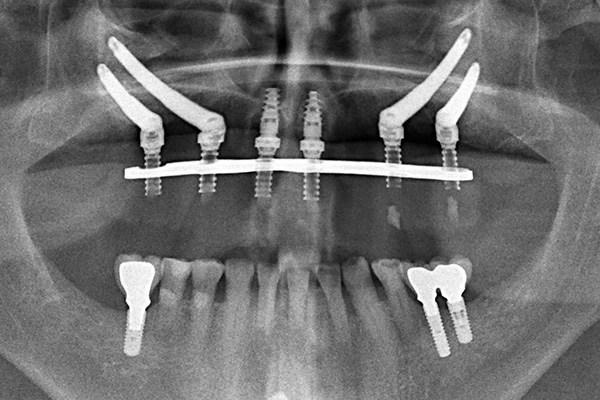 A crown can be placed over the implant within three days of placement. • Bone grafting is not necessary. • Eating hard food such as apples are also possible after three days post implant placement. Who are ideal candidates for Zygoma implants? • People who desire to chew frequently on hard food. What is Quad Zygoma implant? When four zygoma implants are placed, two on each side it is called Quad zygoma. It provides high strength and excellent support for the restoration of teeth. How to choose a Zygoma Implant centre in Chennai? The Zygoma implant treatment needs special setup.Malligai Dental Hospital in Chennai is one of the best setup in chennai where we have all the facilities for a Zygoma implant placement.